It’s been a day that started out with the best of intentions. A day meant for cleaning, organizing, catching up on all those unfinished projects but instead you sat down, just for a minute, to watch a little TV and relax for a moment before getting started. Unfortunately for you and your to do list you stumble across a Planet of the Apes movie marathon. You can kiss the day good bye. Not only are you not going to get any of the chores done, you will not even bother to get out of your pajamas. A day like this is perfect for a dinner like this one. The earthy mushroom aroma of the meatloaf and the warm nutty scent of the Mac n’ Cheese filling your kitchen will make you seem like a hero, like you’ve worked on it all day. You’ll be able to get this started just as you’ve finished your Escape From The Planet of The Apes and be done and ready to serve in time to catch the grand finale of the Battle for the Planet of the Apes. And some of that procrastination guilt will be alleviated by the praise and thanks you’ll receive upon serving this moist, savory meatloaf along side this gooey Mac n’ Cheese with its golden crunchy crust. 2. In a large bowl mix together by hand meat, spices, eggs, and breadcrumbs until a sticky texture is reached. 3. Heat olive oil in a large skillet on medium heat. Add mushrooms and cook until they lose most of their liquid and are reduced by half in size. 4. Add red wine. Simmer until alcohol smell is gone and sauce begins to thicken. 5. Add demi, stirring until evenly dissolved. 6. Add a pad of butter to finish sauce. Turn off heat and stir, evenly blending butter giving the sauce a shiny finish. 7. Place meatloaf mixture in a glass bread loaf pan. Pour mushroom sauce over top. 2. Cook pasta until al dente. Strain pasta and rinse with cool water to prevent from cooking further. Toss with nutmeg, salt and pepper. 4. Place a layer of pasta in baking pan. 5. Add a layer of cheese. 6. Continue with alternating layers of pasta and cheese to the top of the baking pan ending with a layer of cheese. 7. Evenly sprinkle breadcrumbs over the top. 8. Bring half and half to a simmer in a small sauce pot. 9. Slowly whisk hot half and half into eggs just a little at a time as not to cook the eggs. 10. Pour this mixture over mac and cheese. This will hold everything together creating a casserole when baked. 11. Place mac and cheese on bottom rack of the oven to achieve a golden crunchy crust. Cook for 30-40 minutes or until top is golden. If for some reason this doesn’t all get finished tonight it can be stored easily in the refrigerator. Slice up the rest of the meat loaf and wrap each piece individually. This way it can be enjoyed as a sandwich later. It is just as good cold as it is warmed up. 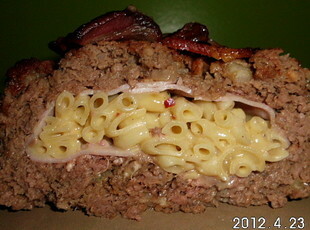 The mac n cheese is almost better the next day nuked in the microwave by itself or with a meatloaf sandwich. This entry was posted in Food and Drink on November 11, 2013 by admin_z.